Here is a great weeknight recipe! Super flavorful, lightened up shrimp scampi! It comes together in about 20 minutes! I promise you will not miss the butter! Prep Ahead Plan: Take the time to peel and devein the shrimp the night before and leave them in a bowl in the fridge. Chop the parsley and garlic the night before too! That is really the most time consuming part of the whole recipe. 1. Heat oil in a large skillet over medium-high heat; add garlic and sauté 1 minute. Stir in fresh lemon juice, lemon pepper seasoning and salt and pepper. 2. Add shrimp and sauté until bright pink, stirring frequently, just a few minutes. 3. Add wine and simmer about 1 minute. add mixture to skillet and simmer 2 minutes, until sauce thickens. If using dried parsley add it now (if using fresh, wait until serving). 5. 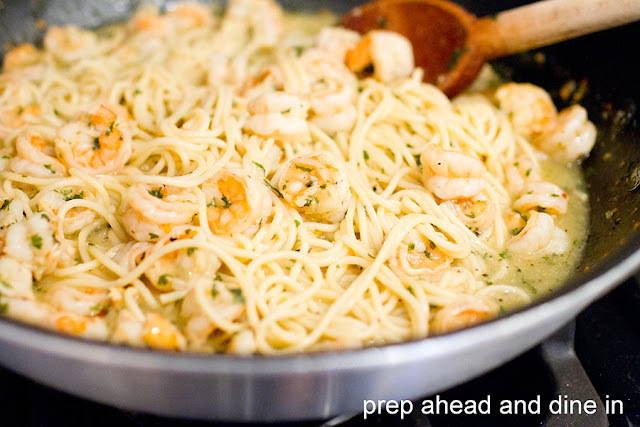 Add cooked linguini to the shrimp and scampi sauce mixture (if using fresh parsley, mix it in before serving). Copyright © PrepAhead and Dine In: lightened up butter-less shrimp scampi. All Rights Reserved.